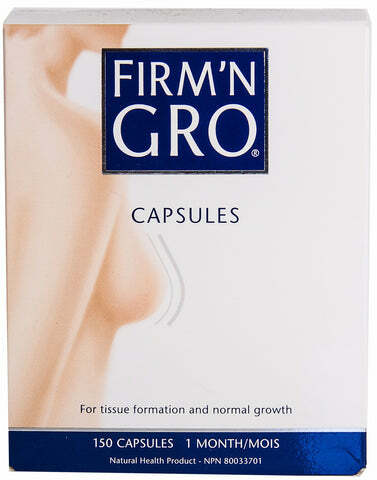 FIRM' N GRO® is a 100% natural supplement specially developed for larger and firm breasts. FIRM' N GRO® is an all natural treatment product based on six carefully selected grains and three types of hops. It stimulates the existing glandular tissue in the breasts. The isoflavones in Firm N’Gro, also called plant hormones, promote the production of body hormones. The body responds, as in puberty, with the production of glandular tissue. The breast enlargement and consolidation effect of FIRM' N GRO® has been proven in double-blind clinical trial among 80 women. The study demonstrated that the special hop compound in FIRM' N GRO® was visibly effective. To strengthen the effectiveness of hops, a natural isoflavone complex was added, after which a study has taken place among 250 women. In practice it appears that the majority of FIRM' N GRO® users gets larger (up to 1 cup size) and firm breasts. Non-medicinal: Colloidal silicon dioxide, magnesium stearate, hypromellose. For enlargement of the breasts up to 1 cup size. FIRM' N GRO® is a completely natural product formulated from 6 carefully selected grains and 3 kinds of hops. It acts upon the present glandular tissue in the breasts. The isoflavones in FIRM' N GRO® activates the production of the body's own hormones. The body reacts just like in the puberal period with the production of glandular tissue. FIRM' N GRO® imitates the breast development process of women in the puberal period. With FIRM' N GRO® your breasts will undergo this process again in a natural way. During the first 8 weeks the breast development is initiated. By then, your breasts will have already become fuller and firmer. Better nail and hair growth. Improved function of the sebaceous glands of the skin. Reduction in pre-menstrual complaints and menopausal symptoms. Reduction in occurrence of vaginal ailments such as yeast infections. Do not use during pregnancy or if breastfeeding. Do not use in combination with hormone therapy, thyroid medication or if suffering from hypertension. It is recommended that people taking medication or suffering from a health problem consult a health practitioner before taking any herbal supplements. The ingredients of this 100% natural patented product are obtained from carefully harvested and selected cereal crops and plants. No substance of animal origin has been added to this product. The cultivation of the crops complies with the requirements of the European Food Industry. Adults: The first week take 2 capsules a day, the second week take 4 capsules a day, then for the rest of the treatment take 5 capsules spread over the course of the day with lots of water and preferably after meals. The effect is seen only if the prescribed number of tablets is taken for a long period of time at least 8 to 12 weeks. Maintenance Dose: Once the 8 month treatment is ended it is recommended to take a maintenance dose of 1 to 2 capsules a day. The results and the way things progress after you stop taking FIRM' N GRO® varies depending on the person and the age. To determine your maintenance dosage base yourself upon what you see in the mirror. Please take note: A small percentage of women will not react to the treatment and their breast tissue will not develop. This cannot be determined before use. If no tingling or visible results are seen after 2 to 3 months discontinue use.